Legal offices such as law firms and judicature are the most significant business entity for every nation. A website is merely a good way to make it familiar among many people. It is also through a website that people from every corner will learn about them and also very helpful in reaching out to its potential clients. Likewise, many new young lawyers are coming out every day and are increasing with time. They definitely need an online presence to let people know them and inquire about them. 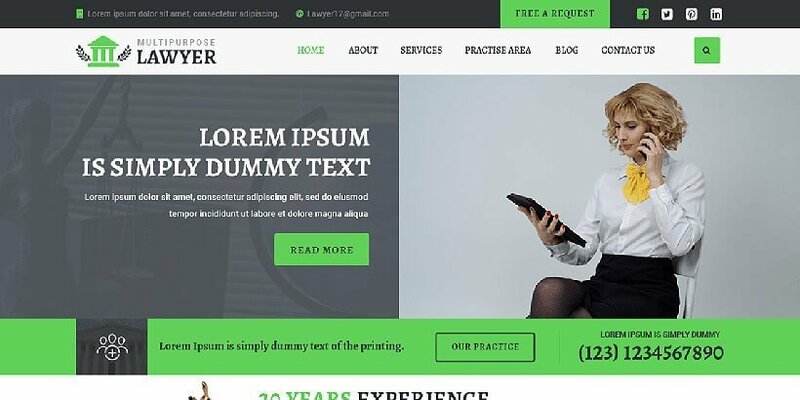 Hence, in this article, we will discuss some of the best free lawyer WordPress themes for developing a professional and perfect law website. 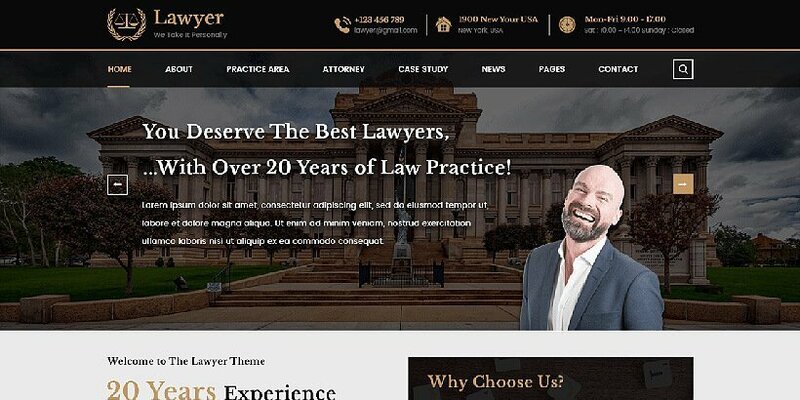 We present you the Best Free Lawyer WordPress themes for 2019! Lawyer Zone is a lovely and modern free lawyer WordPress theme. You are sure to be getting that WOW feeling with its fascinating layout design. It looks absolutely splendid and fabulous and prepared perfectly for your law website. There is a wide range of widgets offered in the theme which will let you showcase different parts of your law offices such as important legal notice, services, and many other things professionally. Many kinds of features are also available in the theme which can make your site more flexible. The theme is extremely responsive so if you want your site to look good in smartphones and tablets then no need to worry about it. With all the amazing kinds of stuff available in the theme, this theme definitely stands out the best among other free law WordPress themes. 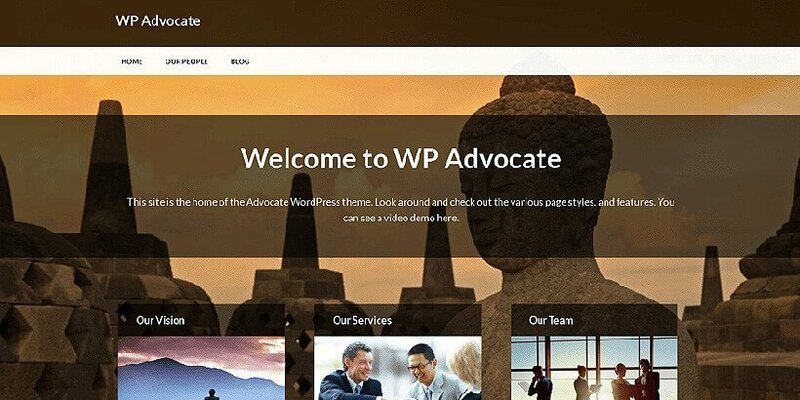 WP-Advocate is a stunning and wonderful WordPress theme build especially for account, law and legal firm. The theme is absolutely user-friendly and very comfortable to customize. Build your homepage as desired with sliders and amazing colors and background images. Put your company’s logo, tagline, and other important things. The theme adapts well with all kinds of modern electronic devices such as smartphones and tablets. Hence, people can easily view your website in their hand-held devices perfectly. As it is an SEO friendly theme, so you can make yourself assure that your site will have a good place in google ranking. Moreover, it has terrific compatibility with WooCommerce. Hence, you can set up an online store on your website and share your products online and start selling. Enjoy the flexibility of the theme and make the best out of it. 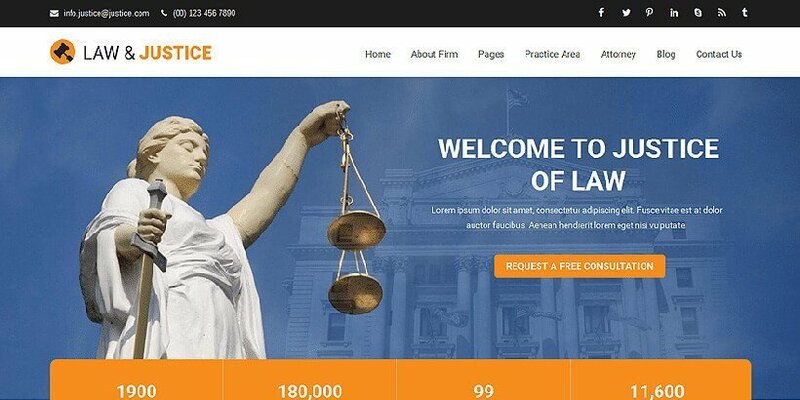 Justice is a magnificent and pleasant WordPress theme made for law offices and firms. The splendid outlook appearance of the theme will make it a perfect choice for the law industry. Besides that, it can also be used as a portfolio site for lawyers, advocates, and attorneys. 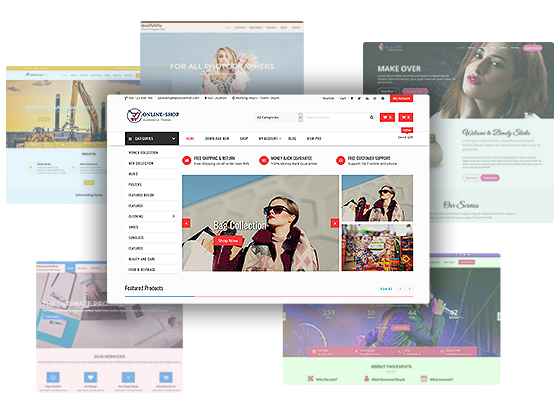 Your site will look amazing in any kind of web browser such as Google Chrome, Firefox, Safari, Opera etc. Being an SEO friendly theme, your site is assured to have a very good ranking on google search engine. Get your site reach the top and known to millions of people around the globe. Design your law site with as many new things as you want to. 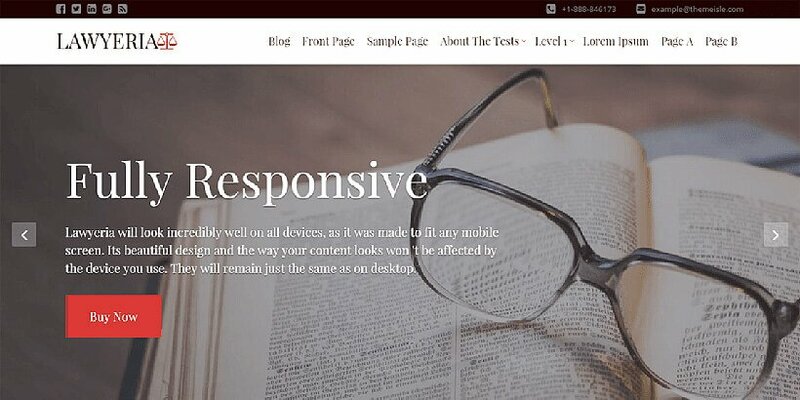 The theme is responsive and it is assured to have your site view well in smartphones and other devices. W3C validate code and well-commented code. Legal is a simple yet sophisticated WordPress theme. Any legal and law firm can use this theme for building the online presence of their company. Though its a modest looking theme it offers some good features for its users. With this theme, you can have your site look perfect and organized in mobile devices also. Whether it’s smartphones or tablets your site will adapt well with any kind of device. It is also a translation ready theme so just in case if you are looking to have your site in another language then it will be done comfortably with ease. Well-Prepared documentation is available within the theme to provide you guidance in using the theme properly. The supreme appearance of the theme will make its visitors overwhelming and curious. In addition to that, astonishing features included in the theme will elongate the theme to be more flexible. 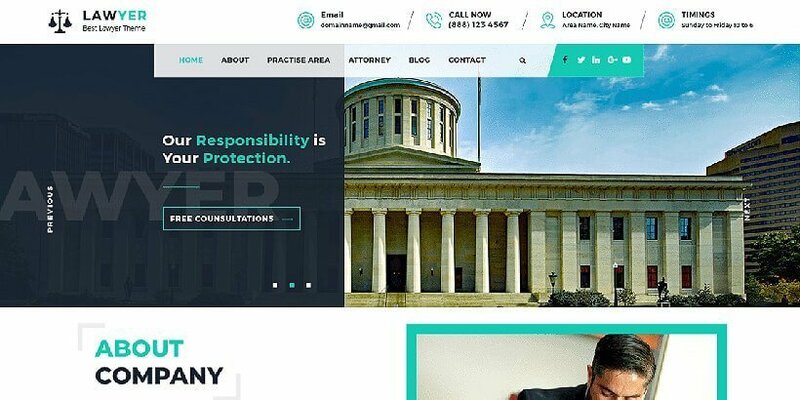 Lawyer WP is a one minimalist free law based WordPress theme that will be a perfect fit if you want to make a simple site on a law firm. Expose about your law company by providing detail information about it online on your site. The theme has that every elementary feature for your site. The beautiful featured slider on the front page makes it an appealing one. The theme is highly responsive and it is assured to have your site view well in smartphones and other devices. You can also make extra changes in your site like changing the font and color of the text of your site, the shapes and size of other elements, etc. It has the feature of custom CSS so you can add your own CSS code to modify your theme. The theme has good compatibility with WooCommerce so you can open your online store on your website if you wish to have one. It has social media integration to let you connect your website with your various kinds of social accounts and lets them know what your site has to offer. 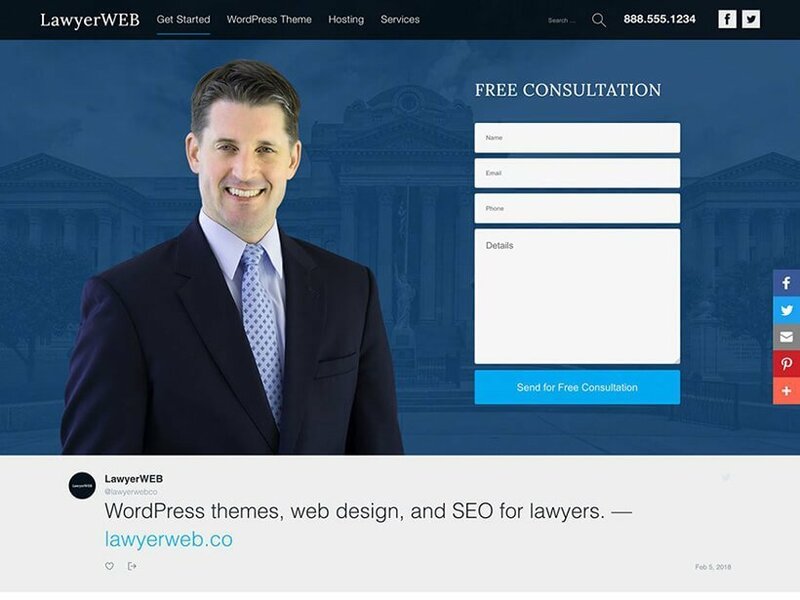 VW Lawyer Attorney is a highly responsive and lovely WordPress theme that has been built particularly for a law, legal and attorney firms. A good way to represent your company is through your website so this one is an ideal choice for a company that is focused on law. The theme has been terrifically designed in a well-organized manner as a demo so users can set up their website within a minute. It has a homepage, contact page and blog page designed supremely by default. The theme has good compatibility with WooCommerce so you can do a lot with the theme like opening an online store and showcasing varieties of products of your choice. It supports almost all kinds of plugins that includes its latest version. It also has a special feature of linking your website with your social media accounts such as Facebook, LinkedIn, Twitter and many others. Lawyer Landing page is an outstanding and modern free WordPress theme based entirely on law and legal firm. A good looking and perfect theme to showcase a law company in a professional manner. It has in-built live customizer through which you can make modification in your site while previewing the changes on the other side. Users can enjoy using its amazing widgets and make their site more creative. The theme has good speed optimization so your site will load quicker at a fast pace. The call to action (CTA) feature in the theme adds more beauty to the theme. It will give your site a great way to provide an instant connection with its visitors. The theme is completely SEO friendly so it will create a positive result for your site in the google search. With just a single click of demo import, your site will be ready instantly. Even if you are a non-technical person then you will have no problem in modifying the theme as its customization is done easily. 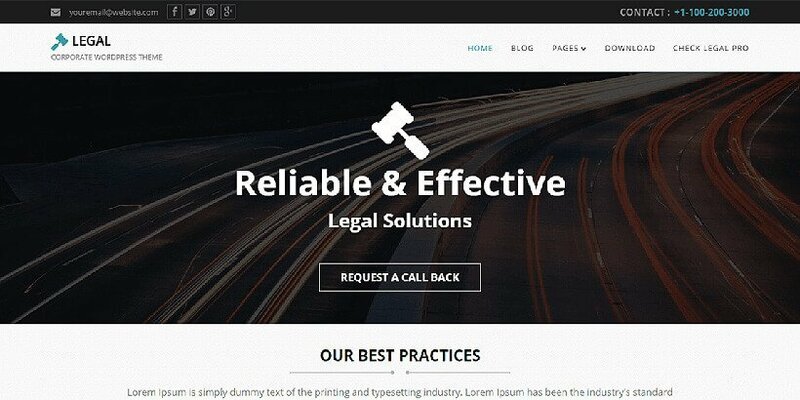 Lawyeria X Lite is a clean and sleek WordPress theme based entirely on law and legal firm. Viewers are assured to be mesmerized with the elegant beauty of the layout design. You can showcase important information about your company in the lovely slider in the theme. With its quick demo setup, you can instantly have your site look exactly like the demo. Also, the less effort required to modify the theme is a big advantage for anyone having no knowledge in coding. The theme is complete translation ready so you can enjoy the feature of having your site ready on other languages also. Besides that, it is also RTL Ready and yes it is possible to have your site ready in RTL mode. The attractive blog section and testimonial section of the theme has been designed in a unique way that will leave everyone astonished. 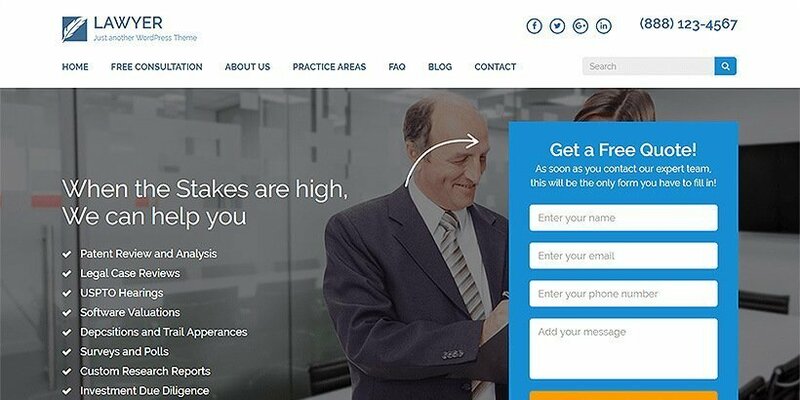 Legal Adviser Lite is a beautiful and modern WordPress theme and is probably a good choice for all kinds of law and legal offices and company. The theme is an extremely responsive theme and fits in all types of mobile devices and tablets irrespective of all kind of screen size. The loading speed of your site will certainly be extremely fast and effective. With its easy customization, people can do simple changes in the theme such as changing the logo, altering layout design, updating new colors in the font, font size, font style and font -family etc. The widgets available in the theme makes it a splendid one and let the user play more with the theme. Just in case, if you get stuck in developing your site this theme comes with a full and detail oriented documentation which will be very helpful in advancing your site. Having good compatibility with almost any kind of plugins you can extend the functionalities of your website. 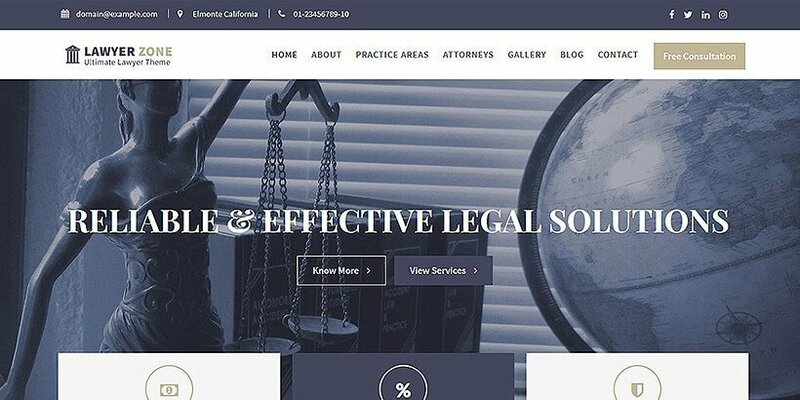 If you are looking for a top-notch and extremely professional WordPress theme for a law-related firm then I bet you will find EightLaw Lite the best choice. Showcase all the important and exciting services of your law firm in the best manner. The sophisticated and well-organized structure of the theme is simply eye-catching and undoubtedly grab the attention of its viewers for a longer period of time. The site looks great in all kinds of web browsers of latest version such as Google Chrome, Firefox, Opera and others. It is also very user-friendly and highly responsive as well. Anyone can customize the theme straightway with less effort. The theme responds well with all the modern electronic devices so clients can easily check out your website in their smartphones or tablets without any problem. 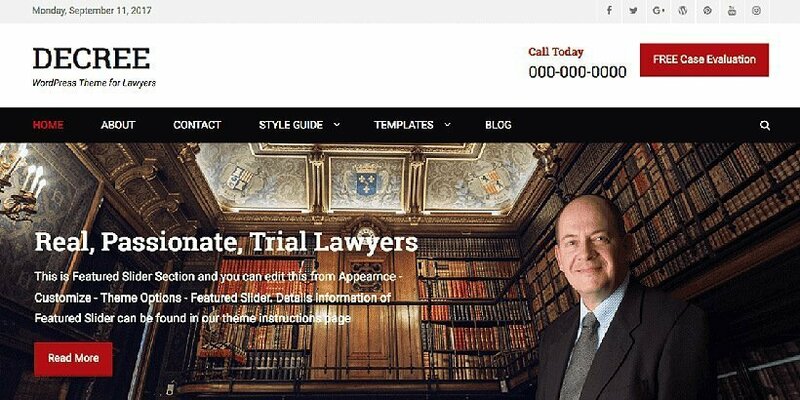 Lawyer Lite is an amazing WordPress theme built specifically for law and legal firm. It is retina ready, translation ready and thoroughly user-friendly theme. Even a non-techy can customize the theme with no need for coding knowledge. It is highly responsive and thus fits well in devices of any screen sizes. You can connect your website to your social accounts and let your friends, families and other connections see about your website. Having good compatibility with WooCommerce you can create an online store in your site and display and sell products online. The theme offers lots of interesting features such as widgets that includes pricing widgets, clients widgets, testimonial widgets. Hence, you can display the menu items, special dishes, and recipes of your restaurant in a professional and modern manner. The theme is completely SEO friendly so that you can be assured that your site will appear at top page in google search. Decree is a creative and captivating free WordPress theme and is mainly focused on law and legal firms. The theme has been prepared perfectly for all kinds of law and legal corporations. You can customize the theme comfortably and make some minor changes like updating new header, background image, sidebar, footer etc. Add more available widgets and section in the layout of your site and make your site more creative and advanced. The theme is wholly a translation ready site so users can get their site in many other languages. The loading speed of the site is utterly very fast and impressive. Hence, your visitors will certainly get amazed while visiting your website. Almost all kinds of plugins get compatible with the theme so you can add as many plugins as you can and enhance the features and functionalities of your site. 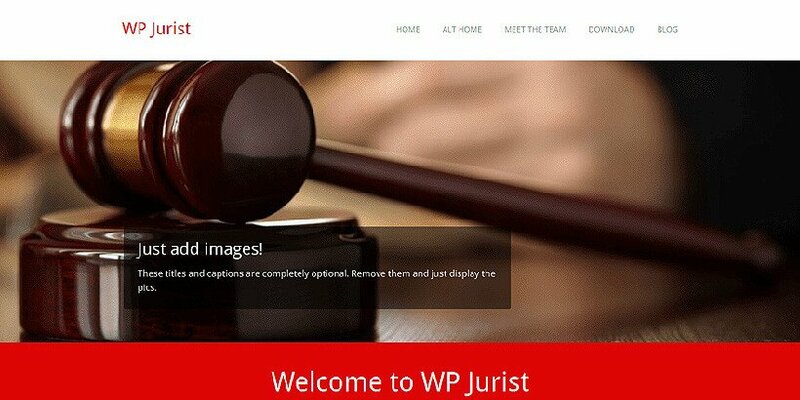 WP Jurist is a wonderful and elegant free WordPress theme made for law and legal firm. Since it is primarily focused on law companies they can take good benefits of the theme and use them fully. Not just for a law office, it can also be considered for a portfolio page for law personalities such as lawyers, advocates, attorneys etc. It is an easily customizable theme and even a non-techy can use and make site modification on the theme with less effort. Also, the WooCommerce integration will allow you to have an online store within your website and display your items throughout the world. As the theme is highly responsive, users can view your site perfectly and flawlessly in any kind of hand-held devices such as smartphones and tablets. It is extremely fast loading so every pages and links of your site will open rapidly with every click. You can add share your social media accounts like Facebook, Instagram, Twitter, LinkedIn etc. within the front page of your website. 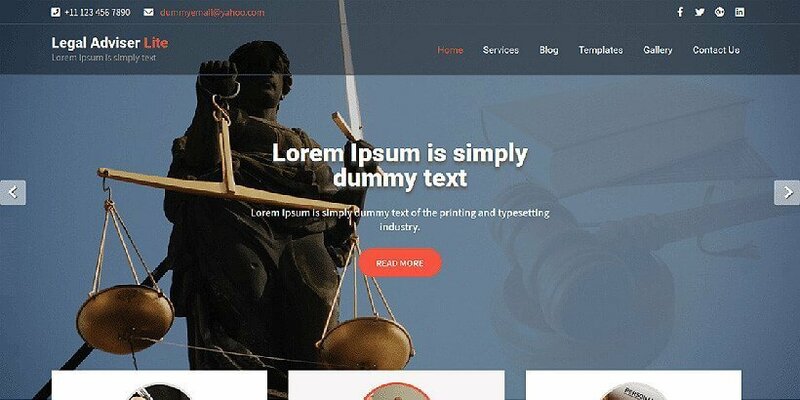 Equity is an awesome, stupendous and one of the best free lawyer WordPress themes. The unique appearance of the theme simply captures the attention of its viewers instantly. With this theme, you are assured to make a cool website with awesome features. The easy installations and customization of the theme make it a comfortable one for all kind of users. It consists of some of best features for color and font option to make your site innovative one. It has compatibility with any kind of browsers such as Firefox, Google Chrome, Opera, Safari and many such. Besides that, it completely SEO friendly. Hence, it is certain that your website is going to have a good ranking in google search. One of the unique features of the theme includes the astonishing animations appearing effects that will give your website an outstanding and modern look. Multipurpose lawyer is a lovely, fancy and one of the best free lawyer WordPress themes. It has a unique and appealing layout design and is well suited for any kind of law and legal office or firms. Also, can be used alternatively as a portfolio page for lawyers, advocates, barrister etc. The theme has compatibility with all kind of browsers such as Firefox, Google Chrome, Opera, Safari and many such. Besides that, it is wholly SEO friendly. Hence, it is certain that your website is going to have a good ranking in google search. One of the unique features of the theme includes the astonishing animations appearing effects that will give your website an outstanding and modern look. 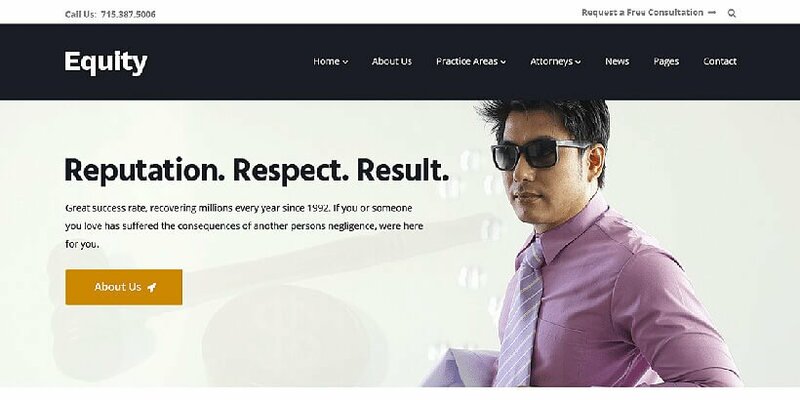 So, those were our collection of some of the best free lawyer WordPress themes from our collection. We have personally handpicked them from the top-notch WordPress theme companies around the world. 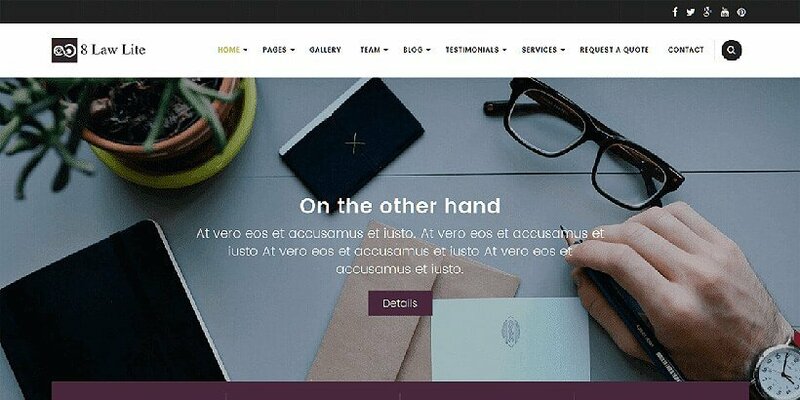 If you are searching for a suitable WordPress theme for any law firm or legal corporation or a lawyer portfolio then the above collection of themes will be very helpful for you. You can choose your favorite one among them and use it to build a fresh and professional law site. 15+ Best Free Event WordPress Themes for 2019!